We are looking to develop a working relationship with Bowling & Co Solicitors. They have kindly provided the information below. In September 2007, following a review by NHS Employers and Trade Unions a package of changes was recommended to the Government regarding the NHS Pension Scheme. All the agreed changes were implemented on 1 April 2008. The NHS Pension Scheme now has two sections the 1995 section whose membership is made up of all eligible staff who were members before 1 April 2008 and the 2008 Section representing all eligible staff joining after 1 April 2008. There are a number of differences between the two sections including the age at which an employee can draw their pension without it being reduced, the way in which the pension builds up and flexibility in drawing benefits. A brief summary of the benefits of each section appears in the table below. Following the implementation it was felt that the new provisions should be offered to existing members of the Scheme (i.e. the 1995 Section). 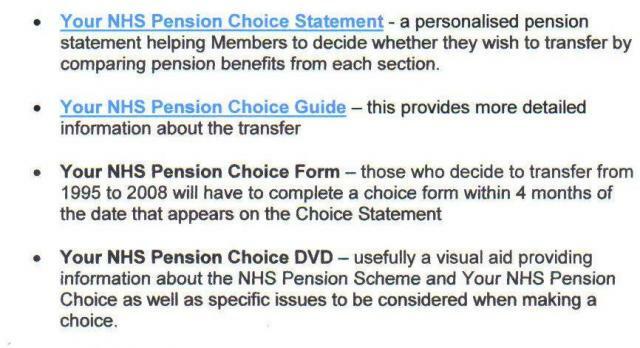 The NHS Pension Choice Exercise (the Choice Exercise) gives all eligible members of the NHS pension scheme a one-off option to transfer from the 1995 Section to the 2008 Section. All staff should have received a leaflet in their payslip in May 2009 advising them of the process. Who is eligible for transfer? 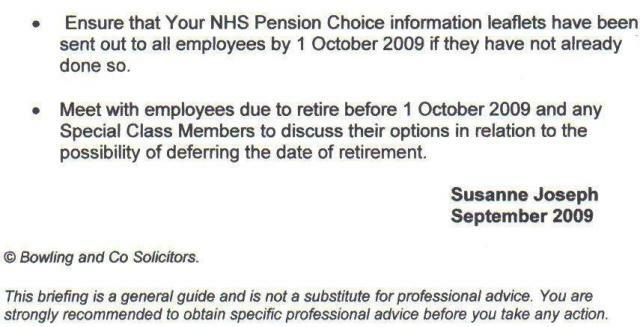 All eligible Members of the NHS Pension Scheme who are due to retire on or after 1 October 2009. The timetable for the distribution of the NHS Pension Choice Pack can be found here. All NHS employers are under an obligation to disclose to all staff details of the pension choice exercise. Any failure to do so could give rise to a complaint to the Pension Ombudsman. Employers will have to illustrate the steps they have taken to comply with their disclosure obligations. What happens to those Members who plan to retire before 1 October 2009? They will not be included in the Choice Exercise unless they delay their retirement date until after 1 October. While employers are under no obligation to defer retirement they are encouraged to work with employees to reach an agreement in those circumstances. For those members due to retire after 1 October but before 1 January 2010 there are special fast track provisions. These provisions are also available for other Special Class Members such as Mental Health Officers. Full details for these members appear on the NHS Pensions website as a factsheet. What happens to the lump sum following transfer to the 2008 Section? Where a member opts to transfer to the 2008 Section then the lump sum that they would have received under the 1995 Section will be calculated to 31 March 2008 and shown as a membership credit. Appropriate adjustments will be made to the Members pension upon retirement taking into account the lump sum. Members however will have the option of increasing the lump sum to be received if they give up more of their pension receiving £12 of lump sum for every £1 of their pension that they give up. Under the new provisions it will not be possible to buy added years. 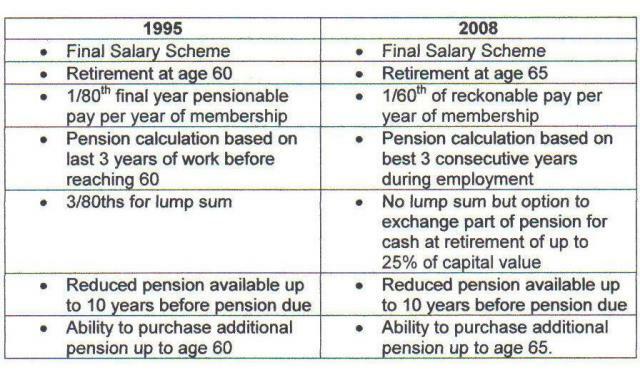 What will happen to added years and additional pension contracts under the 2008 Sections? Added Years contracts will come to an end. Members will receive a membership credit which will be added to their membership up to 31 March 2008 and transferred to the 2008 Section. Additional Pension can still be purchased but upon transfer this will be up to age 65. Where possible the amount of additional pension being bought will remain the same with adjustments to ongoing contributions being made accordingly. The Your NHS Pension Choice website contents detailed information regarding all the above and information on specific issues and circumstances affecting members.